This Cretaceous critter’s origins dates back to 1994 when Arsenal decided to give the club’s younger fans to come up with a design for the club’s official mascot. 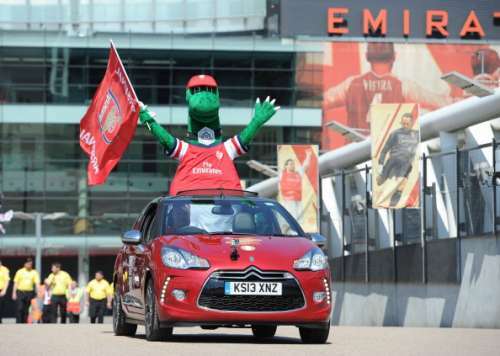 The eight-foot-tall green dinosaur was the creation of Peter Lovell, who was just eleven years old when he came up with the idea of a Dinosaur being the club’s mascot. Apparently, Peter’s inspiration for Gunnersaurus Rex came from the 1993 movie Jurassic Park. Rex is an omnipresent figure during Arsenal’s triumphant moments and has been spotted several times on the squad’s bus parades. Peter’s childhood creation often makes appearances at community welfare meets, birthdays and weddings. More than 23 years since his inception, Gunnersaurus has lifted the spirits of the crowd both at the Highbury as well as the Emirates. Even after two decades, the friendly dinosaur still remains the club’s beloved mascot.